Living together in harmony with nature with a deep respect for all being. Creating a space of love for oneself and beloved ones on your own hectare of Motherland. Aiming for self-sufficiency and autonomy as much as possible. Building a village-community where like-minded people share their knowledge, creativity and passions. Providing sustainable and attainable solutions for the many social and global challenges we face on this earth. Developing new principles of teaching sprouting from the universal truth which lives in every soul. Returning to basics, essentials, peace and solidarity. To spread information about the theory and practice of building an Eco-village. To tell the world about the conception, birth and growth of Eco-village Rivendell. To reach, inspire, motivate, activate and educate people by showing solutions. The menu on the left collects more general and theoretical information about sustainable living, Eco-Villages and Anastasia-Communities. The menu on the right consists of more specific information on the vision and development of the Rivendell Community. News and latest developments you can read on the Newspage. 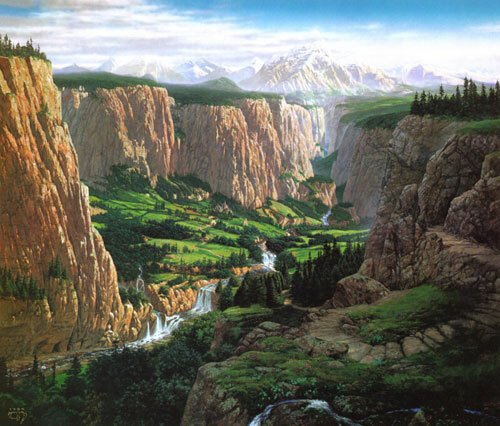 depicted in 'Lord of the Rings', the classic fantasy epic of J.R.R. Tolkien. where the fellowship of the Ring regain strength and where is decided to join forces in the battle against evil. and was also the name of Master Elronds house. Elrond wore the Great Ring Vilya: the most powerfull of the Three Rings. especially during the longtime battle against Sauron the evil sorceror. 'to understand, to create and cure and to keep all things impecable'. The house of Rivendell was not a fortress nor a camp of war. It was a place of science, laughter, peace and quietness, situated next to a river surrounded by mighty woods on the valley. Elronds power lie in wisdom instead of arms. The power which resided in Rivendell was only interested in force when necessary to defend itself. What happens to the Earth happens to the children of the Earth.